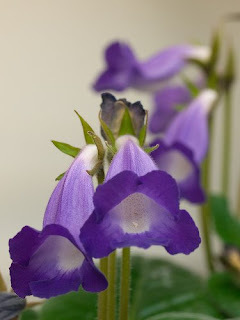 One of my plants that will not be going to the show is Sinningia speciosa AC 1503 (the intials "AC" standing for you know who), grown from seed from The Gesneriad Society seed fund. It's one of my favorites - the flowers are always upright, it doesn't go dormant, and is gently fragrant. This photo is from April - it's now just finished another round of blooms, just a bit ahead of "schedule."